This magical Harry Potter latte mug is sure to get you ready for a hard day of magic. 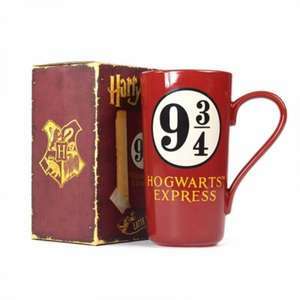 Featuring the famous Platform 9 3/4 and Hogwarts Express logos on one side and the Hogwarts Crest featuring all four houses on the other, it's perfect for those who need a bit of magic - and caffeine - to power through the day. With a closed printed gift box, it's a perfect addition to any Harry Potter display.